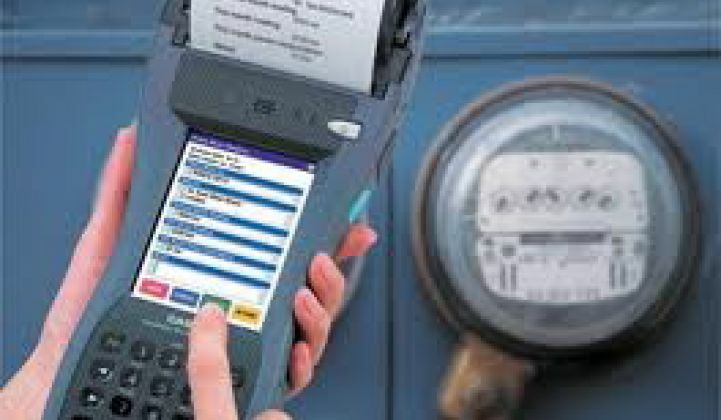 Most of the smart meters deployed around the world today are being used for little more than collecting power billing data -- in other words, they’re remote-control cash registers. But smart meters can also help utilities find nested power outages, predict which transformers are about to fail, monitor power quality to identify unexpected grid balancing problems, to name a few options. Indeed, we’re seeing those kinds of systems turned on today, in bits and pieces. But with the first wave of AMI deployments now going through their paces and being subjected to regulator scrutiny, we can expect another wave of smart meter data management (MDM) to take off, as utilities strive to get every last benefit out of their investment. This evolving MDM market was the focus of a Wednesday webinar hosted by GTM Research and eMeter, entitled “Beyond Meter-to-Cash: AMI for Improving Distribution Operations.” As GTM Research smart grid analyst Zach Pollock noted, the tens of millions of smart meters now deployed across the world constitute the single biggest source of distribution grid data out there, if utilities can put it to use. Larsh Johnson, eMeter CTO, laid out the laundry list of projects that can use well-managed smart meters, broken down by category: outage ID and restoration and protective/preventative maintenance on the reliability side, volt/VAR optimization and conservation voltage reduction (CVR) support, and voltage sag/swell monitoring on the power quality side, and connection model validation, line loss reduction targeting, asset management, and capacity modeling among the list of service and planning functions. “Most of these programs aren’t about doing one thing and saying [you're] done,” Johnson noted. “They’re about continuous improvement.” Indeed, eMeter manages its MDM for its long list of clients, and offers a cloud-hosted version via its partnership with Verizon. MDM can also support business cases for pinpoint smart grid projects, like temporary extra sensors on a transformer or feeder line that the meter data indicates is close to failing, Johnson noted. In fact, using smart meter data to prove the comparative values of a bewildering choice of smart grid investment options is one way that smart meters can help pay for themselves, if in a roundabout way. At the same time, state utility regulators around the country are demanding that utilities prove out the customer benefits of their smart meter investments, Chris King, eMeter chief regulatory officer, noted. Simply measuring the impact of smart meters on grid operations and customer bills requires some sophisticated data management. Applying the data to improve ongoing operations and connecting customers to efficiency or demand response programs is another level of complexity. King highlighted the case of Commonwealth Edison, the Chicago-area utility that has agreed to a state law requiring it to deliver specific benefits from its smart grid plan or face penalties. Achieving goals like a 50 percent reduction in power outages, a 90 percent reduction in estimated billing and a $30 million, 45-percent drop in uncollectible bills will likely require a full-scale meter data management project in its own right. Itron, Aclara, Oracle, eMeter (acquired by Siemens last year) and Ecologic Analytics (acquired by Toshiba’s Landis+Gyr earlier this year) are the five companies that dominate the U.S. smart meter MDM market. The companies have also partnered with AMI vendors like Echelon, Elster, Silver Spring Networks, General Electric, and one another -- Itron and Aclara, for instance, sell their MDM and AMI products together or separately. At the same time, we’re seeing a host of partnerships emerge to link smart meter data to the wider world of smart grid systems. Telvent, the Spanish grid IT company bought by Schneider Electric last year, recently launched its own MDM, built specifically to provide near real-time data to grid operators and other utility users. Dominion, the parent company of electric utilities in Virginia and North Carolina, has teamed up with Lockheed Martin on the Dominion Edge AMI-backed volt/VAR optimization platform that now counts Silver Spring and Elster as partners.